Sheki to host sweets festival. Azerbaijan’s ancient city of Sheki will host the second International Festival of National Sweets, scheduled for July 20. Sweets are an inseparable part of the national cuisine, that’s why the festival will gather cooks from all over Azerbaijani regions. Tahir Amiraslanov, the president of the Azerbaijan National Culinary Association, said this year the sweets festival will host pastry chefs from 25 regions of Azerbaijan, along with international confectioners from Turkey, Greece, Romania, Moldova, Russia, Kazakhstan, Uzbekistan, Serbia, Korea and etc. All around, the event will celebrate Azerbaijan’s rich cuisine and traditions in a joyful national atmosphere. The event participants will display their dishes according to national and regional custom. The treats will be placed in special pavilions equipped alongside decorative household items and rugs, relating to the region in which they are produced. The aromatic festival will be co-sponsored by the Culture and Tourism Ministry, Sheki City Executive Authority, and the Azerbaijan National Culinary Association. Representatives of UNESCO, the World Association of Chefs Societies, and various international organizations are expected to attend the sweets festival. Last year, the event hosted chefs from 23 regions in Azerbaijan and 6 foreign countries. The confectioners from Sheki and Kyrgyzstan were awarded top prize at the festival. Second place was taken by chefs from the Shamakhi region of Azerbaijan, Naftalan city, Turkey, and Georgia. Third place went to confectioners from the Gabala, Shamkir, Balakan regions, Ganja city, and Korea. Sheki is one of the most fascinating ancient cities of Azerbaijan, famous for its own sweet pakhlava, which is made of rice flour, nuts, and sugar-honey syrup. 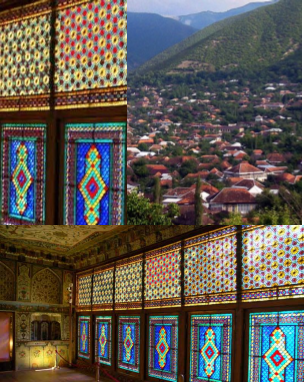 Anyone visiting Sheki will not be able to resist the temptation of its famous Pakhlava. There are more than 30 varieties of Azerbaijani pastries using ingredients such as poppy seeds, walnuts, almonds, sesame seeds, ginger, and cardamom, which make treats spicy and especially tasty. Every region of Azerbaijan has its own special recipe for local sweets, which may even have different shapes depending on the traditions of the region. Pakhlava, shekerbura and badambura- adornments of the Novruz holiday- are among the most famous Azerbaijani sweets.